On Chris Graney’s recent guest post I linked to an earlier guest post that he had written about the Danish Renaissance astronomer Tycho Brahe and one of the new readers, that this link attracted, posted a question that I seem to have answered a lot of times in my life so I thought that this time, I would turn the answer in to a new post. Given that Tycho’s scientific island paradise was indeed financed by the Danish Crown this is a very valid and historically interesting question. Surprisingly, in the first place the simple answer is enthusiasm, Tycho’s all consuming desire to obtain an accurate set of astronomical data on which to base cosmological speculations. This might seem a little bizarre, as you are being expected to believe that the Danish Crown coughed up a small fortune in the last quarter of the sixteenth-century to fulfil the private offbeat desire of one of their aristocrats, but this is exactly what happened, but it was the fact that Tycho was one of their aristocrats that led to this situation. Before going on to explain this let us take a brief look at what exactly it was that Tycho got from his liege lord. The Danish Crown granted Tycho the island of Hven, which lies between Denmark and Sweden, as his fief and supplied him with the money to build both a large manor house, Uraniborg, incorporating the most sophisticated astronomical observatory in the world at the time as well as a Paracelsian chemiatry laboratory, alongside extensive living quarters. In the grounds he constructed a second sunken observatory, Stjerneborg, equipped with the most advanced observing instruments of his own design. Tycho lived in and managed this, at the time unique, research institution with his family and a large staff of technical assistants and servants as well as a tame elk and a dwarf as court jester. The whole operation financed by a generous yearly appanage from the Danish Crown. Why should the Danish Crown finance all of this? The seemingly paradox answer is that if Tycho had not become the Danish court astronomer/astrologer he would have cost the Crown considerably more in lands and money than he did, how come? In the sixteenth-century Denmark was basically a feudal warrior society ruled by an oligarchy of about twenty families that was still in the process of transitioning into a modern state. 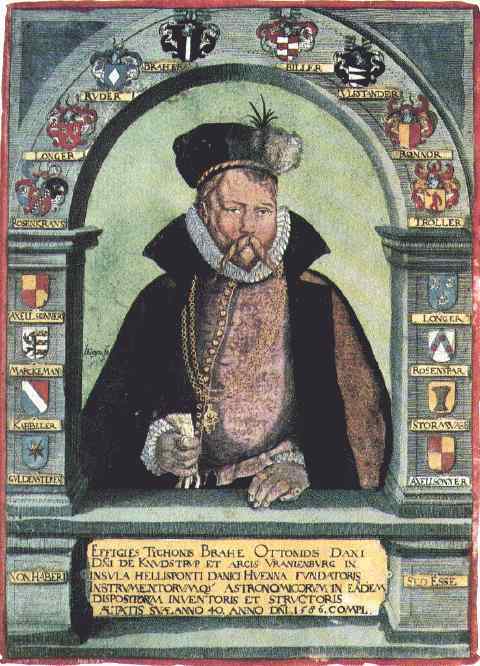 Tycho’s parents Otte Brahe and Beate Bille were both prominent and highly influential members of that oligarchy. When he was two years old Tycho was kidnapped by his uncle Jørgen Brahe (it’s a complicated story) and was brought up by him and his wife Inger Oxe. Jørgen Brahe was an admiral in the Danish navy and Inger Oxe was head of the Queen’s court. Inger’s brother Peder Oxe was finance minister and Lord Steward of Denmark and as such the most influential man in the realm. Tycho didn’t have to climb the greasy pole; he grew up at the top of it and was destined for great things from his birth. It might have been considered odd for Tycho the scion of warriors to become a scholar, both his father and his uncle Jørgen would definitely not have approved, but both were dead before Tycho came of age. However Peder Oxe was a humanist scholar who had studied at the leading European universities and had helped the King Frederick III to set up a humanist university in Copenhagen. For various reasons (astrology, cartography, navigation etc.) astronomy was regarded as an important discipline and Peder Oxe brought his influence to bear, supporting Tycho in his desire to become an astronomer. Tycho was also supported by Wilhelm IV of Hessen-Kassel (who had already set up his own observatory in Kassel), a cousin of Frederick’s, who also recommended giving Tycho the wherewithal to set up an observatory in Denmark. Accepting the advice of Tycho’s prominent supporters Frederick did just that and Uraniborg came into being. However had Tycho completed his university studies of law and become a Danish politician, as was originally planned by his family, then given his connections and his position in Danish society his fief and the incomes granted to him by the crown would have been considerably larger than those he received for his observatory on the island of Hven. By granting Tycho’s wishes and financing what was probably Europe’s first modern research institute, despite the elk and the dwarf, Frederick almost certainly saved crown income. The map of Hven and the pictures of Tycho’s buildings are all taken from Wikicommons and are all originally from Joan Blaeu’s Atlas Maior. 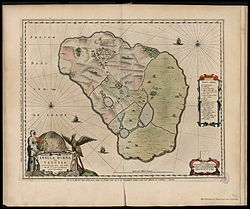 Joan’s father Wilhelm Janson Blaeu had worked as an assistant for Tycho on Hven. I hadn’t imagined the story of his observatory was so involved. Is there a good lay biography of Tycho that you’d recommend? The parenthesis about his kidnapping suggests a story that I ought to have at least read. It was one of the more fun to research. He’s such a character! And following the astronomical investment came the Treaty of Roskilde. Wow, thanks a lot for such a detailed answer.